So, you’ve gotten your film loaded into your camera. But when you try and pull the darkslide out, it seems stuck. Or maybe you got the darkslide out, but now the white tabs are stuck, or you ripped it off. photographer to deal with this little issue. First off, should you EVER encounter ANY pack of film where the tabs are stuck: DO NOT rip the tab. A ripped tab is a guaranteed lost shot, you won’t get it back and could possibly ruin the next photo in sequence as well. STOP at the first sign of trouble and attempt one of the solutions below. they had different approaches to what materials make up the actual physical film pack container itself. If you look inside your camera’s back door in the middle you’ll notice 2 flat metal springs. These are meant to keep a film pack pressed tightly against the film plane. The plastic back of the Fuji can flex and give way a lot more than the metal of the Polaroid. Too much pressure on the back side of a film pack will make it hard, if not impossible, to actually pull your film out of the camera to develop. And it can cause ripped tabs, lost shots and heartache. This is the problem. Here are some of the solutions you can try yourself. 100% chance of success if performed properly. Since the basic issue at hand is the springs inside the back door of the camera are pushing TOO HARD onto your film pack inside, the simplest solution is to just relieve that pressure. If this the first time you’ve had the jamming problem with your camera, this solution is going to be the only one you can try without ruining some of your film. More than likely you are either having trouble getting the darkslide out of the camera, or you’ve taken your first shot and the white tab just won’t pull out. If you did happen to rip your white tab completely off and there isn’t a remnant left to even grab with pliers…you’ve lost this shot. You will need to pull the next tab in sequence to get that ruined shot out of the camera, but in the process this next shot is also going to be wasted, but you should have a fresh tab ready to go next. Though, if the next tab is also stuck, keep reading. If there is even a little bit of the tab left you can save it by trying the following solution. Open the backdoor of your camera ever so slightly. To do so, unlock the switch on the bottom but do NOT open the door. You only want to unlock it. Should you open the backdoor, you risk exposing the film to light leaks. With the backdoor unlocked, the pressure from those pesky springs should be relieved and as such the darkslide or tab(s) should now pull freely. Open the door a little more if its still stuck, but not too much because as you pull the white tab the 2nd larger tab should slowly appear thru the rollers. If the door is open too far, the 2nd tab will miss the rollers. When you begin to see even a tiny bit of the 2nd larger tab appear thru the rollers, close and lock the back door. The tab, if not already removed, should come out and off the camera. The 2nd tab should be fully sticking out the rollers as seen here. With the 2nd tab ready to go, you can now pull your film and develop normally. The springs do not push on 2nd tabs at all, so there’s no chance to rip it. Just pull straight out the camera as you would any other time to begin developing your photo. This should only need to be done for the first 1 – 4 photos. And when you finish off your pack of film, you can they attempt some of the below solutions for something more permanent. But you can always try the above technique and know you can save a stuck tab. 90% chance of success if performed properly. Does not alter your camera. Must be performed BEFORE loading film into camera. So you know your camera has problems with Fuji film packs. You’ve either wasted a couple of shots, or followed the instructions above on how to save your pack and tabs from wanton destruction. Great. But now you want to keep it from happening again. 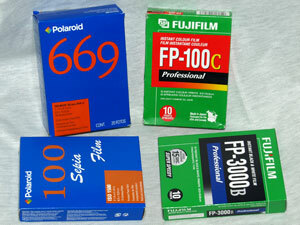 So lets try something you can do before loading every pack of Fuji film. As long as you have not removed the darkslide from the pack, you can do this without fear of exposing the film to light. You will need an empty Polaroid film pack from which you remove the metal back plate. Either pull it or slide it off the pack and do the same to the plastic one on the Fuji film pack. Now, reverse it and put the metal back on the Fuji pack. Hopefully you noticed how it slides/clicks onto the frame and this should go smoothly. If not, remove the back and start from scratch. Don’t bend or break any part of the metal back plate. With the flimsy plastic back plate gone, the springs should have little effect on your Fuji film. Load the film into your camera and see if that solves your problem. And you can remember to do this with every Fuji film pack from now on. You can keep the same metal back plate until, somehow, it breaks. If you still have stuck tabs, use the first solution to save your photos. And continue reading for the next, more permanent, solution. 75% chance of success if performed properly. Those darn springs just won’t stop causing problems for your Fuji films. You can drill out the rivets if you choose. But a simpler choice is to just bend them back and forth until they snap off. Try to do it as clean as possible, you don’t want some sharp, ragged edge cutting your finger one day. With the springs gone for good, the pressure problem should be solved. Without springs you don’t need to continue to try the back swap solution anymore. However, if your camera is a model with a built in development timer (mechanical or electric) in the back door, there is one last solution to try. Obviously this is only for models with timers built-in. Development timers come in two flavors. Both take up precious space inside the back door of the camera. Both can cause the same pressure issue as the springs did. Regardless of which timer you have; just get it out of there. Drill the rivets, or just pry with a big flat screwdriver. Depending on how you remove the timer, you could be left with a big gaping hole in the back of your camera. I find the electronic one’s inner parts can be removed while leaving the dial on the back of the camera. Doesn’t do anything but spin, but there’s no hole to cover up. Creatively cover the hole with something opaqaue. Opaque tape, paper, plastic, anything will work. Just use common sense. Hopefully this, once and for all, solves your Fuji jam problem. If you’ve tried all the solutions here and still have the issue…then solution number one is your only guaranteed work around.